If G. Detou didn’t exist, I couldn’t live in Paris. Seriously. The overstocked, but impeccably neat shelves at G. Detou do indeed have everything, as the name implies in French (J. Detou is a play-on-words, meaning “I have everything”.) But when you’re someone like me that does an inordinate amount of baking, plus loves…and I mean loves…to discover new and unusual foods and chocolates, a place like G. Detou is truly pastry paradise. This little shop near Les Halles is stocked, literally, floor-to-ceiling with everything a cook or baker could want. There’s chocolates from across France, including a huge (and I mean huge) selection of bars including Michel Cluizel, Valrhona, Voisin, Weiss, Bonnat, Cacao Barry—the best of l’hexagone. But even better are the big tablets and sacks that range from 3 to 5 kilos, that hard-cores bakers like me depend on. Although I’m not the only avid chocolate baker in town: When I was in last week, a tiny, meek little old lady came by and left hefting a 3-kilo sack of white chocolate, and a man in a hurry, who didn’t remove the cell phone from his ear while he rattled off his order to the red-coated salesclerk, left with five enormous sacks of chocolate, as well as assorted other goodies. And for those fans of le brownie amèricain, you can find decent-sized tablets of unsweetened chocolate (labeled 100% pâte de cacao) so you don’t have to go to chi-chi chocolate boutiques and chop up a couple of those 7€ bars for a batch of ’em. The first time I saw they carried tables of unsweetened chocolate in bulk, I bought…like, five of them, although I still have a couple left. I was just so excited! And what other goodies are stocked at Detou? 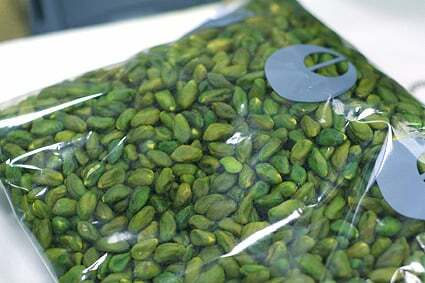 Well, if you remember my Pistachio Gelato, they carry the verdant-green Sicilian and Iranian pistachios that I talked about, which I love to use for decoration too: they make a gorgeous garnish. There’s also a wall of nuts, including big sacks of almonds, hazelnuts, pine nuts, cashews, and best of all, whole pecans, which are all the rage in Paris—with good reason, if you ask me. And of course in another corner is a huge selections of teas, if you’re a foofy tea-drinking type. Of course, I come first and foremost for the chocolate. 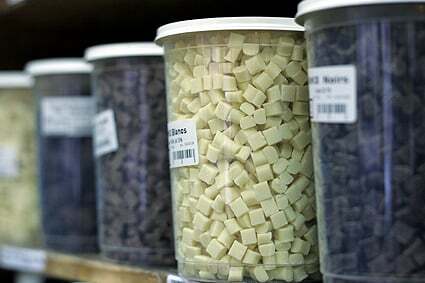 And if you’re an American living in Paris, or a Parisian interested in American baking, they stock hard-to-find chocolate chips in kilo boxes which are priced so that you can actually use them without feeling guilty, unlike the ones sold elsewhere in town priced like precious jewels. But even if you’re a visitor, Detou is well-worth a stop. 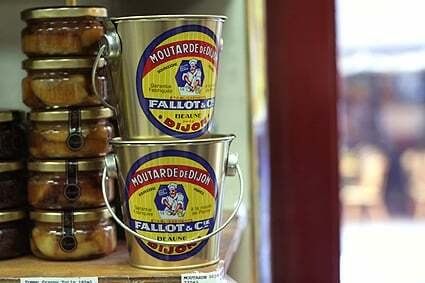 Aside from pretty sardine and tuna tins, each a whimsical work of art, great bargains are kilo bags of roasted cocoa nibs and Edmond Fallot stone-ground mustard, which is the best mustard I’ve ever had and one of the last true Dijon mustards. Although it comes in these decorative tin pails (Hello? Can you say ‘perfect gift’?) 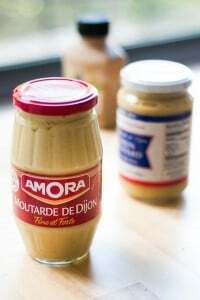 it’s also available in little jars and larger plastic pails for those of you who really, really like mustard and go through a lot of it. And it’s a real deal here; half the price of elsewhere in France. Plus they have every kind, from gros graines to green peppercorn. On my last visit, they showed me their marvelous new selection of hand-peeled fruits from Gascony packed in jars, ever-so-lightly sweetened, which included tiny Seckel pears, small rounds of pineapples, and teensy apples no bigger than cherries. Look up and you’ll see fragrant vanilla beans aplenty, Trablit coffee extract, packages of Spanish saffron, and just off to the side, the latest addition to the shop: a whole range of products for practitioners of molecular gastronomy which looks like a high-school science fair commissary. I also have a cake-decorator friend who stocks up here on silver dragees which she tells me are impossible to get in parts of the US. I know I dragged dear Keiko into Detou when she visited from England so she could get her talented little hands on some glucose, the European alternative for light corn syrup. Ever since Monsieur Thomas took over the shop five years ago, G. Detou’s evolved, carrying more unusual and regional products than ever, including a huge selection of the aforementioned chocolates. It’s my epicenter for anything edible in Paris. Now if I could only find a way to afford the apartment just upstairs that’s currently for rent, I’d be the happiest man in Paris. But knowing that I’m only a short walk away ain’t so bad either. UPDATE: G. Detou has also opened in the city of Lyon, located at 4 rue du Plat (Tél: 04 72 04 06 28). this place is the best! the owner’s daughter is a peach, and speaks great english if you are confused by their lengthy explanations of which chocolate is appropriate to buy (as i was …but i still managed to walk away with a couple of kilos …). the most amazing thing about this place is how tiny it is. I didn’t know that glucose was the substitute for corn syrup here? Thanks for the info! Isn’t G. Detou amazing? I asked Mr. Thomas about the name and he said it was actually the founder’s name, Gerard Detou, it just happened to work out perfectly. I love to go in there just to chit chat with the two guys who are in there on the weekdays, they’re so funny. I don’t know what I’d do without that store. Jeez! That’s a beautifully organized store right there. I believe I could spend days there if I ever had the chance. Do they have beds? I’m sitting here in front of my computer nibbling on my little heart. It tastes pretty good with my sucre a chouquettes sprinkled on it. :) Luckily, I still have some left from when you generously shared your loot when you were last here. When I come back, (oh when oh when will that be?) I will plan on an hour or two here. Sounds just like my kind of place. And I’ll bring an empty suitcase just for all the sucre a choquettes I’ll bring back. That place would ruin me. The tea! Top row second on the right. Blue and gold label! That is my favorite Russian tea. It’s like Earl Grey, but not only flavored with Bergamot oil, it contains lime and lemon oils too! Oh, and I’m running low! Thanks for providing a new stop on my next visit. That place looks amazing..and fyi for New Yorkers..they carry an incredible selection of that tea pictured, at Zabar’s..I have been drinking it for the past couple of years..I have tried two flavors and I am ready for more. Michael said the mustard in the pail is the best too! We love the pail with the mustard. Got it in Brisbane CA. 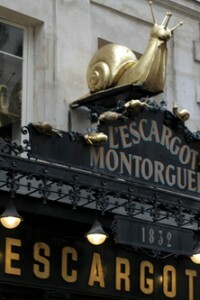 OMG, how did I never notice this shop before when I’ve been to Paris?!!! Probably too busy in my other “dens of iniquity”: bookshops! Thanks for the preview tour! lagramiere: I bring vanilla extract back from the US, since I don’t like the vanilla extract and ‘aromas’ with sugar that they favor here. I order mine by the quart (which is very economical) from Patricia Rain at Vanillaqueen.com and bring it back with me. Her vanilla is the best I’ve tasted—the Mexican is like sniffing Vanilla Ice Cream! joanne: That tea company opened up their own shop in the 6th, near the rue de Seine, which looks pretty interesting. I plan to stop in one day. Thank you from my hard little heart. I really wanted to find a place like this last time, but instead ended up paying a huge price for a handmade umbrella! I did get to to the food hall at Bon Marché, which was a productive hour. Thanks David for this very good link … it seems ridiculous to come all the way to Paris to buy tea, but it’s that Russian Tea which you can no longer buy in Fortnum’s … but also the wondrous selection of dragees – and, as you say, the little buckets of Dijon mustard. I’m getting right on to Eurostar to see if I can get there in time for Xmas shopping! David, my Parisian cousin just gave me this address to try when I’m in Paris in January: rue François-Miron 30 -Marais(the name of the place remains a mystery). It is supposed to be a wonderful epicerie. 30 rue François-Miron would be Izrael, Le Monde des Epices, another great shop but nowhere near as extensive as G. Detou. I used to buy a kilo of French green lentils at Izreal to bring back to the US before they became so readily available here. 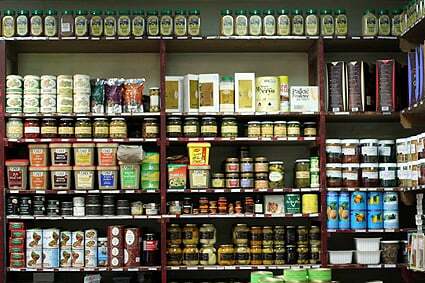 Good selection of spices (of course), dried fruits and packaged goods also. Well, I just had to join in the Kusmi Tea chorus. My favourite is the second from the right, on the top. The Prince Vladimir. Stop making me want to go to Paris so badly! …Alright, I guess that’s your job. Rohan & Joanna: Hmm.. I’ll have to check out that Kusmi tea. They do have a couple of shops in Paris (and a website). 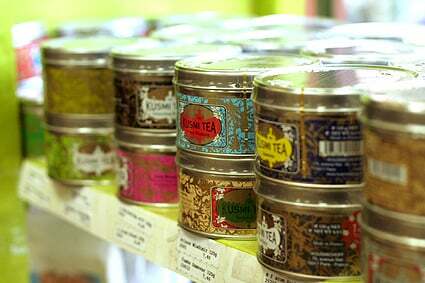 At Detou, I usually just make a beeline for the chocolate, but I thought those tea tins were so pretty. Nice to know what’s in them lives up to the gorgeous packaging! AH! I just wish you’d posted this before my trip to Paris back in April. Everything is so lovely and I nearly drooled reading your descriptions! Flavia & Marcia: Yizrael is interesting but rather pricey, which is probably due to their location on a now-trendy street in the Marais. Unlike Detou, I don’t think very many professionals shop there and they certainly don’t have the selection of chocolates that Detou has. Plus a lot of stuff has dust on it which leads me to believe it hasn’t moved much since it was put on the shelf. Still, it’s nice to poke around at Yizrael if you’re in the area and the stuff in the bins, like the dried fruits and the mixed olives, are interesting. Oh THANK YOU for this address. I will be there pronto on my next voyage. LOve the pictures. The problem with Detout is that they have almost zero organic food, which means they sell food full of carcinogenic pesticides (good for Alzheimer and Parkinson too), and with lower quantity of vitamins, since organic food contains on average according to hundreds of scientific studies between 30% and 50% more vitamins and other elements crucial for health. 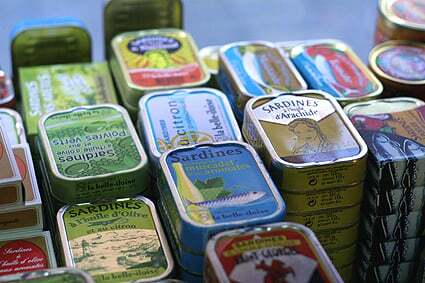 I did a test to verify if his old and apparently prestigious/carefully selected brands were as good or even superior to organic food: I bought a can of sardines in olive oil and pepper: it was not good, unlike the great organic ones (olive oil and pepper too) I so love. So I know I am right. The problem is that the big boss is totally obtuse: he gave me an absurd reason for not selling organic, which is typical of neurotic persons: they do not make any sense. Some of the old brands he sells maybe be organic without the certification because sometimes companies/peasants do not bother, but to sell only a couple of organic products in such a supposedly prestigious shop is a joke nowadays, when people are waking up and realizing how destructive for the Earth and for taste and for health industrial agriculture is. 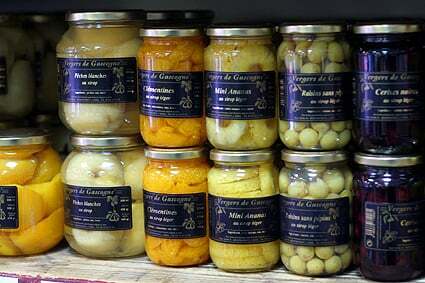 There is a good organic shop one minute from Detout, at the south end of rue Montorgueil. Some of the prestigious old brands of chocolate like Weiss (sold by Detout) have received terrible marks in chocolate testings organized by consumer magazines, so I am not alone in criticizing the kinds of brands sold by Detout. Oh my! I could spend a week in that shop and never see the light of day! It will be my first stop on my next visit to Paris. Thank you for sharing it. I would so love to be in Paris now, poking around & gathering goodies in G Detou, or at camp Cassoulet (one of our winter favorites—for what passes for winter in CA), or having a hot chocolate with salted butter caramel with you. I keep thinking I can wait to go back, but really, no. You WILL know when we return. Lisa may make choquettes for the holidays, or was that in my imagination? David why oh why do you torture me so?? Kusmi Tea! My favorites: Spicy Chocolate (of course), and Christmas Tea, which has orange, almond, rose, vanilla and spices. I would go broke and die happy in that shop. Thanks for the vicarious thrill. While I am completely in agreement that organic methods of production are generally better for the environment, this isn’t always true. I’d rather buy local than organic (though local organic would be best) – after all, organic green beans flown in from Kenya are probably worse for the planet than non-organic local ones. But, organic food is not always better quality. It may be, because those who choose to produce food organically generally are more aware and focused on quality. But organic and good-quality are far from being synonyms. There are many organic brands that I admire for their ethical stance but which are simply not as good taste-wise as other non-organic products, Green & Black’s chocolate being a case in point. It’s ok, but there are many better-quality non-organic chocolates, in my opinion. Too often people assume that organic=most delicious. This I think is leading to a culture of companies seizing the opportunity to use the organic label to sell very ordinary if not sub-par products at extremely high prices, without the public seeming too willing to question their taste-quality, because ‘it’s organic, so it must be good’. Not always true. I went in there and got weak in the knees! That calcified stuff is all over everything! I couldn’t believe my eyes? Well I stopped drinking it but it wrecked havoc on my hair WHEN I CAME BACK to the dear USA! Anyway I hadda say this..
You are welcome to remove it. gorgeous post!! i love little shops like these that inspire you to cook/bake…. thanks for posting one of your favorites! This is always one of our stops in Paris. I love the Cacoa Barry pistoles, the almond paste and the variety of dried mushrooms. My husband goes with me to rein me in! I found G. Detou by chance and took 2 of my newly-made friends who have lived in Paris for 8 years and they didn’t G. Detou existed. And there I was new in town for about 3 weeks only and I was proud to be the one sharing something new with them. I agree.. isn’t the place great! it’s wonderful what they have. Especially LOVE the vanilla gousses. I want to jump on a plane to Paris right now! A bit belated, I know, but thanks so much for this excellent suggestion. I went there on a gift hunt today and found so many wonderful things, from those great little cans of sardines to pieces of chocolate molded and wrapped in foil to look like sardines. Guaranteed to please all tastes! I stopped by G. Detou last week when I was in Paris. It was heaven! I bought 50 (!) Tahitian vanilla beans, 1 kg blocks of Valhrona, silver dragees which I remember from my childhood but cannot find anywhere nowadays, and candied violets and rose petals. The candied rose petals are fantastic ! What should I do with them? I am thinking white choc, raspberry, and rose flavored petit-fours or an opera cake. I also bought a huge, copper frying pan at Dehillerin. Unfort my luggage hasn’t yet arrived (I only got home yesterday) and I am going to commit murder if my foie gras and choc don’t show up soon. Thank you so much for a great blog! I’ve heard people mention your name for years in the ‘Celebrity food god’ category. Wow, you’re as good as they say. Love your website and blog. I should be working, but can’t stop clicking onto more pages on your site, archives and information. My daughter and I have been searching for some of the macaron ingredients Pierre Herme’ recommended. He never mentioned G. Detou and we can’t wait to go there. Their main recommendation was Le Bon March’s Food Hall. But it no longer sells the Valhrona or other ingredients he listed. BTW thank you also for your adapted macaron recipe and advice. Pierre Herme’ Macaron book is extremely difficult to follow, including errors in measurements. in my dreams I visit this shop…you oughta be ashamed for creating an unrequited yearning…deep sigh…. Ohhhhh WOW. I am gobsmacked. This is my kind of heaven!!! OMG the sardines!!! Thanks very much for sharing!!! David, is it possible to take all of this goodness back on the plane? I know mustard and chocolate is okay, but the pistachios? and the jarred fruits? Do you think they would have violette extract? I am visiting in July and really want to get my hands on some of this… This looks like a great stop – I appreciate the advice. 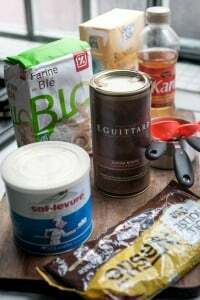 I am into decorative baking and sugar my own violets – do a ton of things by hand, but have seen violette pearls and so many gorgeous FRENCH items that bloggers say they got in Paris… and I want to knwo where! Valerie: I don’t know for sure if they have it or not. If not, you might want to try Goumanyat and see if they do, as they have more esoteric items. Loved this store! 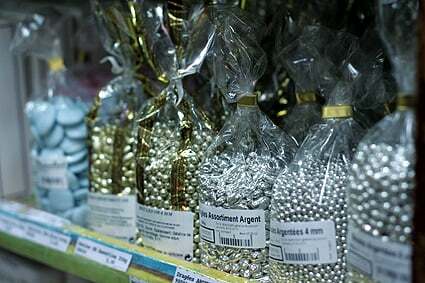 I picked up a lot of tahitian vanilla and might pop back in today for a last visit and pick up some silver dragees (completely forgot yesterday, being so overwhelmed with the choices available at the store). When I finally got there, I wanted to ask you, ‘how did you find this place, David’ – for surely it’s like a hidden treasure! Thanks for the heads up! the apt we are renting is on the SAME street!!! WooHoo.